Safety net and welfare reform issues are frequently in the spotlight – and likely to remain there in 2018 – for two reasons. Michigan has a large low-income population. And the social safety net costs taxpayers billions of dollars per year. 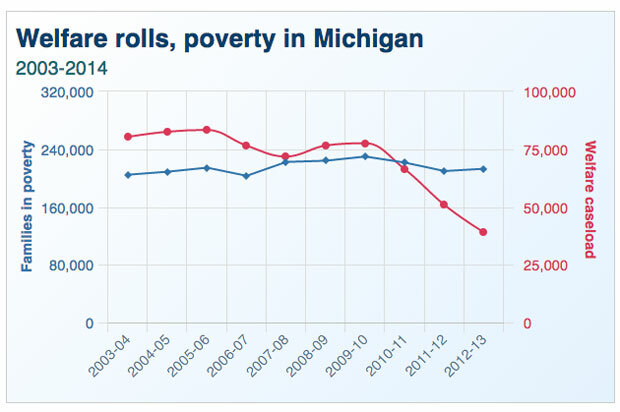 Sixteen percent of Michigan households and 22 percent of Michigan children currently live in poverty. Another 25 percent of Michigan households live above the poverty line, and have jobs, but live paycheck to paycheck with no savings, according to the Michigan Association of United Ways. Meantime, health care and other social safety net programs total more than $25 billion dollars in the state budget. That’s 45 percent of the overall state budget, including pass-through federal revenues. In 1991, Gov. John Engler signed a law ending general assistance, cutting off welfare payments of about $144 a month to 80,000 able-bodied adults without children. Critics said it would harm vulnerable recipients, while officials said the state could no longer could afford the program. Average monthly caseloads on state cash assistance by fiscal year. Then, in 1996, Congress approved sweeping reform that converted federal welfare aid to states to block grants – giving them wide discretion on how to spend the funds. Backers said this would allow states to more nimbly help recipients off welfare and into work. On average, half of all U.S. welfare money controlled by states goes to programs aimed at getting recipients back to work. They include cash assistance, child-care and work-related initiatives. In Michigan, it’s less than 25 percent - one of the lowest rates in the country. Under federal welfare reform, state welfare spending must meet one of four goals: Helping needy families, getting recipients into jobs, reducing out-of-wedlock pregnancies and encouraging two-parent families. Since 2007, Michigan has spent more than a billion dollars from the welfare program on college scholarships, with some funds going to middle- and upper-income students attending private Michigan colleges. That includes students from families earning more than $100,000 a year. 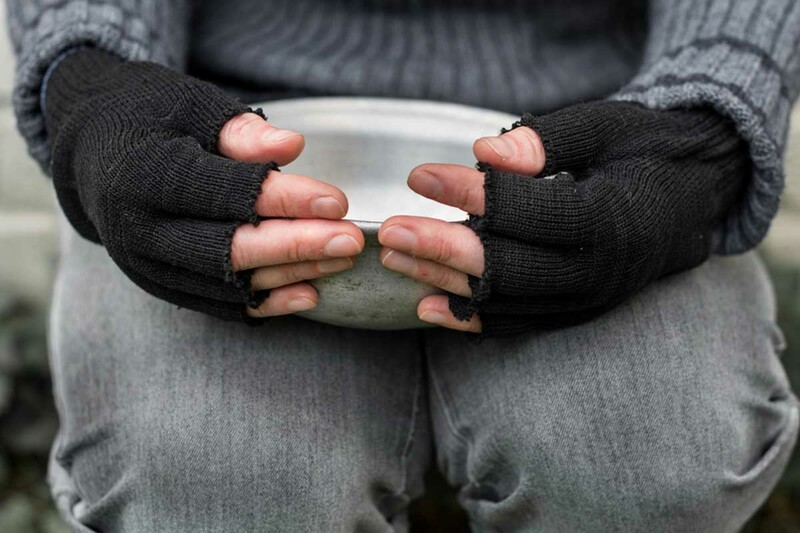 Advocates for the poor argue those funds could be better used to help the truly needy. State officials maintain that students who attend college are less likely to have children out of wedlock. On paper, welfare spending in Michigan has remained level. But the number of Michigan families getting cash assistance fell by half from 2007 to 2013, even as tens of thousands of families still struggled with poverty and unemployment coming out of the Great Recession. Concerned that some on welfare were abusing the system, state lawmakers in 2011 approved a measure to limit recipients to four years of cash assistance. Those who were on welfare for more than four years dating back to 2007 were kicked off the program. Twelve months later, the state was spending $18 million less a month on cash assistance, likely the result of both welfare reform and an improving economy. While reform advocates said stiffer time limits would force recipients to find work, it is unclear how many found jobs since the state does not track recipients after they leave the system. In 2013, legislators responded to allegations recipients were abusing cash benefits when they banned use of Bridge Cards at ATMs in casinos and strip clubs. Low-income residents can use cards to buy food and other items at the store. The measure was approved following revelations welfare recipients used benefits to get nearly $90,000 from a Detroit casino. The following year Gov. Rick Snyder signed a law to create a one-year pilot program to screen some welfare recipients and test those suspected of drug use. In a 2016 report to legislators, the Michigan Department of Health and Human Services said the pilot program did not catch any recipients using illegal drugs. Michigan’s unemployment insurance fund is another piece of the safety net, giving workers a financial cushion when they lose jobs. But a state calculation that it could streamline claims processing by turning fraud determinations over to a computer backfired, resulting in thousands of false findings of fraud. In August, the state agreed to refund nearly $21 million to residents after reviewing cases in which the Unemployment Insurance Agency falsely accused tens of thousands of people of benefit fraud. The state found that more than 44,000 cases out of 62,784 with fraud findings did not involve fraud. The UIA said it is committed to improve its system through enhanced training, policy changes and changes to the computer system. These federal funds should be going to help the poor. I happened to work on a contract with Michigan Works when people were kicked off of cash assistance. That was done in response to a federal law (thanks Bill Clinton) that limits cash assistance to 5 years total in a lifetime. Some states had not used the five year limit (apparently Michigan was one) but Michigan decided to impose it thus cutting off many people. By the way, cash assistance might amount to about $400-500 a month. No one is getting rich off of welfare. Most of the clients I worked with were young and already had 1-4 children. Someone asked me once to describe our clients. I said: "To a person, they are unparented." The stories I heard over and over of abuse, drug addicted and alcoholic parents, domestic violence, neglect were just heartbreaking. These were kids. 18, 19, 20, 21. Think about your own son or daughter at that age. Imagine them trying to care for small children, survive on public assistance, live in dangerous neighborhoods, take the bus everywhere, work hard to comply with the many, many rules and regulations to receive assistance (the days of lying on the couch collecting a check are long gone, folks) with no family support. I couldn't have done that at 18 or 19. We are cruel to the poor. I would challenge any lawmaker to spend one day in the shoes of a young woman on welfare -- wake up at her house, get her kids ready and on the bus to school or take them by bus to daycare, make your required appointments and assignments (work and volunteering) to comply with program requirements, figure out how to feed, clothe and house your family on about $1000 a month in cash and subsidies. We assume people begin on the same playing field we started on when indeed thousands of people have never even visited that field, have no idea what it would be like to begin at our ground zero. I'm generally conservative politically, but conservatives know nothing about welfare and they are, as a political entity, mean to the poor. God forbid you should ever fall between the cracks yourself.